The idyllic Kuehtai in the Tyroleanr Oetztal comes up with snowy pistes, glorious deep-snow slopes, an action fun park and numerous offers for the whole family. Convenience for guests is guaranteed in Kuehtai: no matter if you use the modern ascent supports or the services, such as the ski rental of INTERSPORT Rent - the guest ranks first in Kuehtai. A winterly paradise with ideal conditions for skiing, snowboarding and carving awaits you in Kühtai only 30 km away from Tyrol's capital Innsbruck. 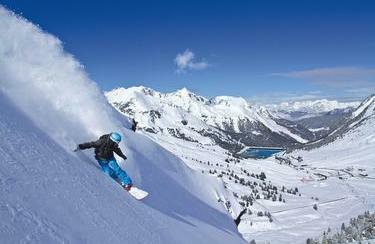 On 44 km of pistes you can choose among slopes on every level of difficulty. Modern transport facilities, such as the 8-seated Kaiser Gondola or the three connected 4-seated chairlifts, carry you comfortably up the mountain - without long waiting times. If your ski equipment is totally convincing, you have the opportunity to buy it. In this case up to two day of rental fee will be deducted from the price. INTERSPORT Rent in Kuehtai gives you the chance to put the latest ski models to the test in order to prevent a mispurchase. Do you have questions in terms of ski rental and extensive services of INTERSPORT Rent? Then visit the shop of INTERSPORT Rent in Kuehtai. The professionally educated team is looking forward to advise you on proper ski equipment and gives valuable tips for perfect skiing holidays.